Every 40 seconds, someone in America suffers a stroke. *About 795,000 strokes afflict people each year, with 600,000 of those being initial occurrences; and those numbers are increasing every year. Over HALF of all stroke victims suffer from a resulting condition, called Hemiparesis Subluxation. This dislocation of the joint is caused by the damage to the brain affecting motor skills and muscle control. Because the muscles no longer hold the arm in place, it falls out of socket. This causes immense pain to the patient, and many lose functionality due to current treatment methods relying on immobilization. Attempts have been made at developing slings to help these patients, but all produce negative secondary effects, while barely helping the primary condition, the shoulder subluxation. I have invented a sling that allows the patient full range of motion, while supporting the arm properly, with none of the negative qualities associated with other existing slings. Patients can begin rehabilitation sooner, while reducing their overall pain level and medication consumption. When my girlfriend had a stroke in April of 2012, I learned first hand about both the physical and financial hardships that stroke patients endure. her doctors recommended none, due to negative side effects associated with slings in existence. I decided that “no” was not a good enough answer and so, I made my own. Her pain medication consumption dropped 80 % over the first two weeks AND she began regaining use of her arm. It gave her back her mobility and greatly benefited her recovery. Her therapists suggested I obtain a patent, and push to get my sling to the public. I filed my patent application and began marketing them. most patients cannot afford one; and, because my sling has not yet been tested for approval by the FDA, nor is it covered by insurance plans or Medicare. become a part of standard practice. Every patient deserves the chance to recover, now you can help give them that chance. When both cuffs are on, the semi-elastic straps cross in the rear, and loop through quick-release buckles, allowing for full adjustment and quick removal. 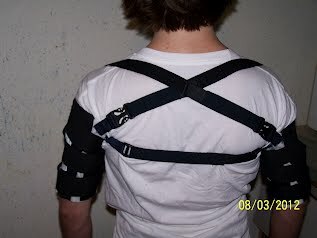 A third straps connects the arm cuffs across the rear, also semi-elastic, and fully adjustable. Because of the placement of the straps, the arm is supported both vertically and horizontally. Because the semi-elastic nature of the straps, the arm has full range of motion without losing support. Because of the strap configuration, the arm is supported by the entire upper body; without hanging from the neck or injured shoulder. The sling is also comfortable, and can be worn under over-garments, or coats. Clinical testing is one of the goals of this crowdfunding project. Till now, the evidence gathered has been by patients whom I’ve donated slings to. This article was written by a customer of mine in West Virginia and appeared in thw Spirit of Jefferson County newspaper. This article was written by a customer of mine in Idaho. Obtaining FDA approval is another goal of this crowdfunding effort. Stroke patients often find themselves in financial hardship and cannot afford treatments that aren’t covered by Medicare, Insurance, or other forms of assistance. Once FDA approval is obtained, I believe my sling will become part of standard practice with all stroke patients, without patients having to fear the additional cost. Patients have described a pain reduction around 75%. arm is anchored by the opposite arm, the healthy arm is able to recreate therapeutic exercises, helping to strengthen the affected arm. In addition, the sling also helps the patient maintain positive posture, assisting in their overall mobility. My sling helps therapists and doctors increase recovery rates and decrease pain levels for patients suffering from a stroke-related hemiparesis subluxation. the sling can also be used in cases of Traumatic Brain Injuries and Sports Medicine. This sling is a crucial step in recovery and can thereby be recommended by both doctors and physical therapists. Physical therapy is about strengthening muscles and gaining mobility — this sling acts as a crutch for patients and can be worn during any part of the recovery process. My total goal for this project is $10,000; however that plan is to get there in $100 milestones. First, the total goal amount covers the costs of obtaining FDA approval, Medicare/Insurance approval, and international patent protections to allow the treatment of patients worldwide. The total goal amount will, also, cover the necessary materials to produce the slings to be donated through this project. Donors can contribute any amount they choose. Every time donations collectively reach a $100 milestone, I will donate one sling to a patient who desperately needs one, but cannot afford one. Because most stroke patients are usually unable to continue working, their new financial hardship leaves them unable to afford my sling when they need one. For every $100 level passed, I will donate a sling to someone who desperately needs one, but cannot afford it. Even the smallest donations, can help change the life of someone in need. In gratitude, we'll list you as an Angel Supporter on our web site. Forever. AND.. Nominate the person of your choice, or ORGANIZATION/NGO of your choice, to receive a sling. Be listed as an Angel Donor on our website, forever, and...Nominate the person of your choice, or ORGANIZATION/NGO of your choice, to receive a sling. Every time we pass a $100 level, a sling will be donated to someone who needs one, but can't afford one. A sling will be donated to someone that needs one, but cannot afford one, in your name or one you provide. Your name will be embossed on the sling to be given away, so the recipient will always know who made their sling possible. You will also be recognized on our website as a Sling Donor. A sling for you or a loved one. A customized sling, with your name or the name of you choice embossed on the sleeve, for the loved one of your choice! DOCTORS/ PHYSICAL THERAPISTS: Get a CUSTOMIZED sling for your office or practice. Send us 20 patient reviews (or 10 patient referrals) and we'll send you another! DOCTORS/ PHYSICAL THERAPISTS: Get 2 CUSTOMIZED slings for your office or practice. Send us 40 patient reviews (or 20 patient referrals) and we'll send you another free! Send us your logo or name and please add $10 for shipping. DOCTORS/ PHYSICAL THERAPISTS: You will receive a sling in each size (3) for your own examination/practice; you and your practice will be recognized as a Pilot Partner on our website; and 2 slings will be donated to a patient that cannot afford one, with your name embossed on the inside. CLINICS/ OFFICES: 5 CUSTOMIZED slings with your/ your clinic's name embossed. We'll also list you as a PILOT PARTNER and FEATURE your practice on our website. HOSPITALS/ PT CENTERS/ REHAB CENTERS: 10 Customized slings, plus a free demonstration led by the creator! INSURANCE COMPANIES: Your logo on our website AND 10 Customized slings for you to distribute amongst your policy holders/ service providers. We are open to negotiating other deals with insurance companies in order for more patients to be able to afford the Sublux Sling. Please get in touch with us to find out more. HOSPITALS/ PT CENTERS/ REHAB CENTERS: 20 Customized slings, plus a free demonstration led by the creator! And be featured on our website as a PILOT PARTNER along with a blurb about your practice and a link to your website. And, we'll send 5 Customized slings to people in need. RESEARCH PARTNER: Up to 40 slings to be used in trials, plus rights to the data of the conducted trials to be published. Use of data is negotiable, as are details. Please get in touch with us for further details. MEDICAL DEVICE/ THERAPEUTIC DEVICE MANUFACTURERS: The first right of refusal.